This coming Friday sees the release of one of the most eagerly awaited chick flicks in ages. 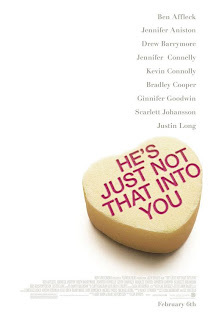 Based on the best seller, "He's Just Not That Into You" boasts a veritable who's who of pre-baby boomer tinsel town all tossed together on the silver screen: Jennifer Aniston, Drew Barrymore, Scarlett Johansson, Justin Long, Ben Affleck, Jennifer Connelly, Kevin Connolly, Bradley Cooper, Ginnifer Goodwin.... *whew** Exhausting. Can I stop naming co-stars now? Sure, it's not deep like 'Milk' and won't get nominated for Oscars like 'Slumdog Millionaire' but it will elicit plenty of laughs and sometimes that's all we really need. Opens February 6. I really wanna go see this. Looks good. Went to see it last night and it is really very good. The right amount of laughter, tenderness and reality. The girl Gigi, is every single woman in one. Love her. Thanks for the mini review, Misty!